Plenty of consumers have taken an interest in reasonably priced 7-inch tablets, especially in the US where content-focused devices such as the Amazon Kindle Fire and the Nook Tablet have had buyers lining up, no doubt because of the $200 and $250 price tags. It looks like Toshiba is trying to get in on the action with its new Toshiba Thrive AT150 tablet, which promises to give you a full-featured Android experience in a compact 7-inch format. Unfortunately, while the 10-inch Toshiba AT200 sports an ultrathin and minimalistic design its smaller brother is no supermodel and actually looks and feels quite chunky. It's 12 millimetres thick and weighs in at 400 grams, which puts it in the same ballpark as Amazon's Kindle Fire. On the flipside, the rubberized back is nice to the touch and the tablet feels good in the hand. The brand says that the Toshiba Thrive AT150 will give you up to six hours of battery life on a full charge, which is actually decent considering there really isn't room for a group of large Apple iPad-style batteries inside this thing. The 7-inch screen gives you a full 1280 x 800 pixels and features Toshiba's Adaptive Display Technology and Resolution+ Video Enhancement Technology. Does it make a difference? Hard to tell but all in all the screen seemed to perform well during our short encounter on the CES expo floor. Toshiba gives you the choice between a 16GB and a 32GB model but you can always satisfy your craving for extra storage via a Micro SD card. The tablet also features a Micro HDMI port, Mini USB 2.0 port and a docking connector in the bottom that's flanked by stereo speakers. You get Wi-Fi 802.11 b/g/n and Bluetooth 2.1 and you will have to tether this thing to your smartphone if you want to get online while on the go. Beating inside is NVidia's somewhat dated Tegra 2 chip running Android 3.2.1, which is kind of a let-down. We'd love to see a faster processor running Android 4.0, and while navigating the user interface, opening apps and browsing a few websites we encountered the lag that's been defining for most Android tablets for quite a while now. Eventually Toshiba will update the Thrive AT150 with a delicious serving of Ice Cream Sandwich but there's probably nothing the company can do to squeeze out more performance from the Tegra 2 chip that was actually unveiled a full two years ago at CES 2010. On the front there's a 2MP webcam with a microphone for your video chatting needs, and on the back we find a 5MP camera with auto-focus, capable of 720p video capture. We tried shooting a few clips but due to too many drinks and late nights, our hands were shaking quite a bit and the videos ended up shaky and almost unwatchable. Were Toshiba able to price this thing competitively with the Amazon Kindle Fire or Nook Tablet, we might actually snag a unit but unfortunately you'll need to dig a bit deeper in your pockets. The 16GB model retails for $380 and the 32GB model is another $50. 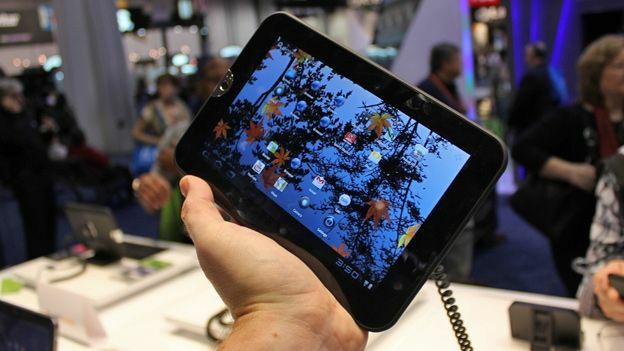 That's just too much, especially considering that ASUS before summer will bring to market a Tegra 3 tablet at just $250.